The Centre will grant citizenship to all Chakma and Hajong refugees living in the Northeast but ensure that the rights of indigenous people are not diluted, Union minister Kiren Rijiju said Wednesday. The Chakma-Hajong refugee issue was discussed threadbare at a high level meeting convened by Union Home Minister Rajnath Singh and attended by Arunachal Pradesh chief minister Pema Khandu, Union minister of state for Home Rijiju and National Security Advisor Ajit Doval among others. Addressing reporters after the hour-long meeting, Rijiju said a “middle ground” would be chosen so the 2015 Supreme Court order to grant citizenship to Chakma-Hajong refugees could be honoured and the rights of the local population not diluted. “The Supreme Court order has to be honoured. Chakmas are settled in Arunachal Pradesh since 1964. But ST status and indigenous people’s rights won’t be diluted,” he said. 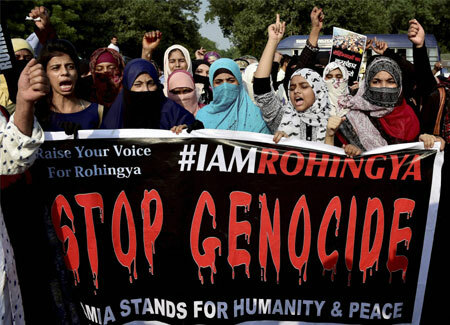 The initiative on the Chakma and Hajong refugees comes amid the ongoing row over the Central government’s plans to deport Rohingya Muslims, who came to India due to alleged persecution in Myanmar. Rijiju, who belongs to Arunachal Pradesh, has said Rohingyas are illegal immigrants. Several organisations and civil society in Arunachal Pradesh have been opposing citizenship to the Chakma and Hajong refugees saying it would change the demography of the state. The central government is trying to find a workable solution by proposing that the refugees will not be given rights, including land ownership, enjoyed by Scheduled Tribes in Arunachal Pradesh, an official said. However, they may be given Inner Line permits required for non-locals in Arunachal Pradesh to travel and work. Rijiju blamed the Congress for the current situation, saying that the then government had settled the refugees in Arunachal Pradesh without taking the local people into confidence. “Congress has done great injustice to the local people. We are trying to find a middle ground so that the Supreme Court order is honoured, the local people’s rights are not infringed and the human rights of the Chakmas and Hajongs are protected,” he said. The minister said a petition may be filed on the issue in the SC soon. Chakmas and Hajongs were originally residents of the Chittagong Hill Tracts in erstwhile East Pakistan who left their homeland when it was submerged by the Kaptai dam project in the 1960s. The Chakmas, who are Buddhists, and Hajongs, who are Hindus, also allegedly faced religious persecution and entered India through the then Lushai Hills district of Assam (now Mizoram). The Centre moved the majority of them to the North East Frontier Agency (NEFA), which is now Arunachal Pradesh. According to officials, the number of these refugees has increased from about 5,000 in 1964-69 to 1,00,000. At present, they don’t have citizenship and land rights but are provided basic amenities by the state government. In 2015, the Centre was directed by the Supreme Court to confer citizenship to these refugees. The Arunachal Pradesh government approached the apex court to review its order but in vain. After the Supreme Court’s rejection, both the central and state governments have started consultations to find a solution to the issue.